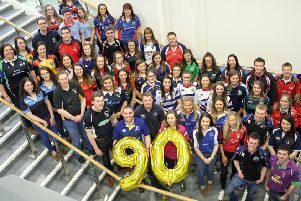 On Tuesday, April 9 Garvagh YFC held their annual parents’ night in Main Street Church Hall. The guest speaker was Claire Sugden who gave a really inspirational talk on her role as an MLA. The club would like to thank everyone for coming to support them once again - they had a great evening of entertainment from a junior sketch to a club choir to ‘Guess the Young Farmer’ to prizes and not forgetting the club’s fantastic one act play To Love and to Cherish. The club would like to wish the members taking part in the one act play the best of luck for their performance on May 1. The new main office bearers are as follows: Barbara Blair, club president, Michael Torrens, club leader, Sarah Cunningham, club secretary, James Millsopp, club treasurer and Rachel Boyce, club PRO. Garvagh YFC are also looking forward to their annual big breakfast and car wash in Aghadowey on Saturday, May 11. Full Ulster Fry will be served in the main hall from 9am to 11am. Both cars and tractors are welcome.